Description: Rice: A Global History presents in detail the historical journey that rice has taken, from its early origin as a staple food in Asian and West African countries to its ubiquitous place in meals across the world today. 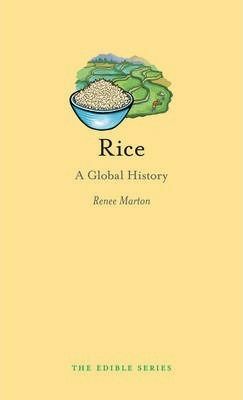 Rice has become a significant and indispensable agricultural product worldwide, often through slavery, indentured labour and immigration. An important part of many well-known and popular dishes, rice is both a key ingredient of high-end cuisine and a staple of more inexpensive, everyday meals. This dichotomy has existed since the early years of the grain's burgeoning popularity, when the rice trade was driven simultaneously by profits from the high-status commercial export of rice and the lower-quality rice eaten by workers and labourers. Increasing urbanization and the rise of marketing, advertising and military requirements have all influenced the role of rice retail through the years. Though not heavily traded worldwide, rice has long had a strong influence on the global political scene.It also has deep emotional significance at the table, where it holds great importance integral to many ethnic identities and appears in cultural rituals, literature, music, painting and poetry.